Using SQL repair software, MDF recovery can be done with ease & confidence. Our SQL Recovery tool is extremely easy-to-use. Using new technology appears a difficult task to most of the novice users and beginners with the computer system. Some regular users are also reluctant from using new technology. If you are looking for easy and simple MS SQL file recovery, then we can provide you that. This has also been our most important endeavor to make our products easy-to-use. Also, from the feedback of our satisfied customers, we have collected that our SQL Recovery software is much easier to use, as compared to the counterpart Microsoft SQL data recovery tools available in the online marketplace. You will get this product trial (free SQL Recovery software Demo Version). You can evaluate SQL Database Repair software before purchasing it. Demo version is functional and you can see the process to recover SQL database and you can even preview the recoverable items but cannot save them to your system as the file saving option is restricted in the Demo Version. SQL Suspect Database Recovery: You can use SQL Recovery software to recover database from suspect mode. Using our simple and intuitive tool, it will be very easy for you to recover SQL suspect database. 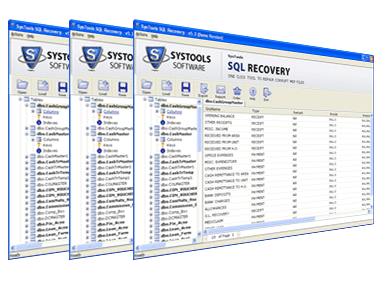 SQL Master Database Recovery: You can use our software to recover SQL master database. You can recover SQL server database elements (stored procedures, constraints, values, functions, views, tables, tables' data, default rules, triggers, checks, user data types etc). You can even recover unique keys, foreign keys, and primary keys. SQL express database recovery also possible. Software automatically creates a script file (with .sql extension) to save recovered SQL data. Most Windows OS versions are supported (98, Me, NT, XP, 2000, 2003, Vista, Win7 & Windows8). You can restore SQL database from MDF file completely by retrieving all your SQL Server database items from corrupted or damaged MDF files, using our software. Buy the Full version of SQL Recovery software to recover ALL items and to save them to your system. "Simple algorithms and effective steps make the software the most needed solution ever analyzed. With the sql file recovery tool one can move forward with the confidence of perfection and success in process execution. Support team is highly co-operative and suggestive to help us how simply we can get the mdf file recovery done with the sql file recovery tool." "SQL database repair tool can be the best ever possible solution to recover sql server corrupted mdf file to healthy format and with this the entire database, tables, rows and other details can be recovered without any data loss. SQL server stored data can be the best choice for the user who wishes that after corruption the data can be recovered easily without data loss. Select the format to save from two as- sql server database or sql server compatible sql script accordingly." "Free of trouble download, free of cost process analysis and free provision to view recovered data- all these amazing facilities we enjoyed with the free version of the software demo downloaded. With the full version purchased and help of the support executive we got the complete data recovery done with ease. I review this tool with a point of 10 out of 10." "Thanks for providing a perfectionist solution to repair corrupt SQL MDF file. I lost the last hope of getting my MDF file data but MDF Recovery software rendered me right help. What I liked most about the solution was its excellence to perform quickly with no compromise in quality of results."